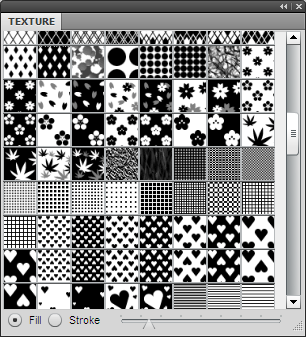 I would like to “Texture panel” like a Photoshop’s brush manager in Fireworks. For Fireworks users and me, I made it. First unzip, next 2 files copy to your Command Panels folder where (ex.win) “C:\Program Files\Adobe\Adobe Fireworks CS4\Configuration\Command Panels”. reboot Fw, just installed. It browse texture in applications texture folder and show them.Then select texture,apply your selected object.Default texture opacity is 0 ,change parameter as you like. The slider in panel can change texture size for looks in panel. language setting: Japanese and en_GB. but filesystem is Japanese. bug fix:Stroke color was fill color / The file name in a few space include was’t change texture. structure change:Some function call in swf file. There function was moved to jsf file. You need some texture? Go this site. You can get over 100 texture for such commercial use. 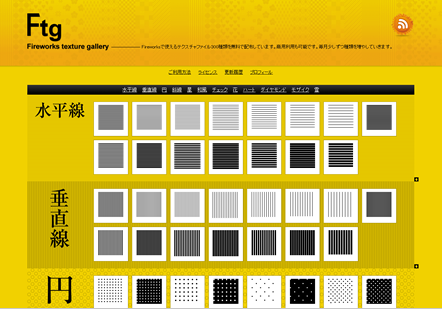 These texture and site made by Daisuke Hayashi (Japanese Web Designer), So copyright is belonging to him,too. I think path error by language. Whether can change language setting for cs4&cs3 ,I found to it. Please wait,sorry. I would like to contact Daisuke Hayashi to distribute his nice textures. Do you have his email? His profile page is here. Some bug was fixed. try again, please. If texture don’t show in panel seem so file path problem. If other possible, wrong file name with textures… Would be helpful if you get me in any state. Looks like a cool extension. Where is the application’s texture folder? Can’t seem to find it. If you use win CS4 ,folder is “C:\Program Files\Adobe\Adobe Fireworks CS4\Configuration\Textures”. Please try it. I visited your friend’s website and could not find how to contat him. Do you have an email to send me? Check “Amount of texture” in Texture of PROPERTIES panel , perhaps “0%”. My Texture panel set this parameter when first setting is “0%”. I will improve next update. nice work! tested working in CS5. Can you do similar panel for photo browser that can do drag and drop? you can drag and drop in Fireworks CS5 with Adobe Bridge. In Fw menu. File > Browse in Bridge. browse photo folder, then drag & drop in Fireworks. “Mini Bridge” mode is useful. Recommend use with Fireworks and Bridge. I deleted some textures from my fireworks textures folder while fireworks and this panel where open. Now this panel no longer displays any textures no matter how many times I restart. Any advice? I’ve tried deleting and reading the files. Awesome! Although I’d prefer they were kept at the correct size. Any chance of allowing sorting into groups. I have so many textures and Fireworks just throws them into a big bin.